"Newark's most modern air conditioned Cafeteria and Snack Bar, accommodating 165 patrons." 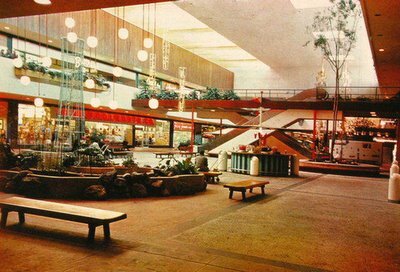 (Excerpt) It was during the 1960s that the shopping mall took off as a retailing phenomenon, particularly in the United States. 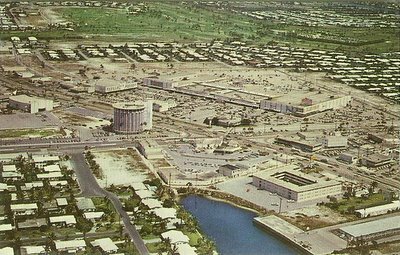 In 1960 there were 4,500 malls in the US, and they accounted for approximately 14% of the country's retail sales; 15 years later the relevant figures had leapt up to 16,400 malls and 33%. In the US, the first shopping mall (the Northland Center) had appeared in 1954 in Detroit and this new type of shopping centre had proven extremely popular. Bush Fair Shopping Centre (don't think it's called that anymore), in Harlow, was a quaint open-air pedestrian mall, nestled amongst several similar "shopping precincts" (as they call them) in the famous Harlow Town Centre retail area (still there today) in Merry Old England. Kind of looks like some schools I went to as a wee lad, actually. But still groovy either way! A lush court area in the eastern end of Century Plaza Mall in 1976, not long after it had first opened. This image comes courtesy of patriarca12's flickrset (I adjusted the brightness a little for use here, so we could study a bit more detail). 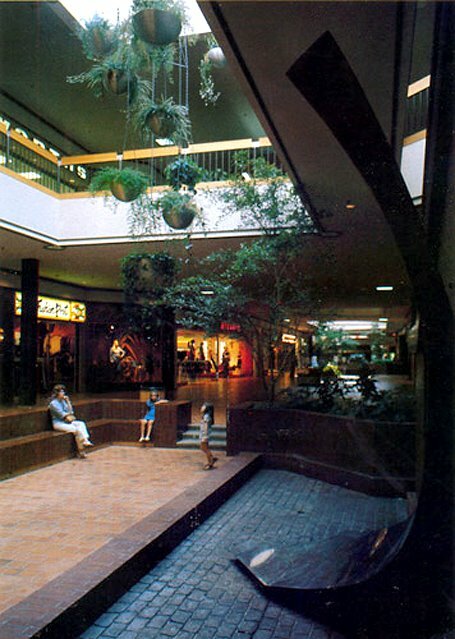 "The mall was a prototypical 70's dark wood/dark tile/lots of ferns & ficus type structure. It centered around a circular middle, which was home to the India Shoppe (almost a sort of head shop, one could purchase their reggae/alternative/punk t-shirts, incense, bongs, etc. here - and get pierced) and a jewelry store. In the late 80's the mall was remodeled to resemble every other mall of the time period - skylights, white paint over the wood finish, lighter tiles, etc. Many of the best tenants began to leave - among them B. Dalton, Bookland, Musicland. Not much changed at Century until rather recently." Powers store looking quite swanky here in this vintage exterior view of the Knollwood Shopping Center in St. Louis Park, Minnesota (though if you look close the signage there says "Knollwood Plaza" under Powers). 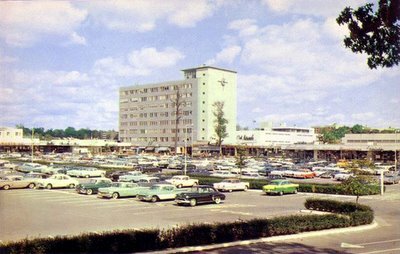 This is a very early photograph taken, I believe, around the time the shopping center first opened (as Knollwood Plaza?). And she couldn't look more glorious. 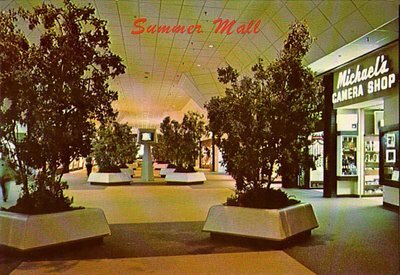 Sadly, according to the latest reader-submitted entries over at Dead Malls, this mall is sort of still there today, such as it is, but barely hanging on, a mere ghost of its former self. 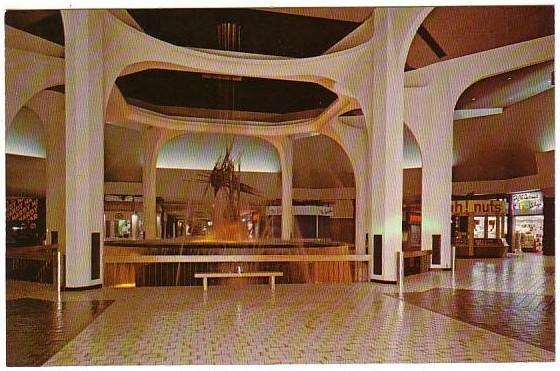 Not a particularly flattering shot of Coral Ridge Mall (or any mall for that matter), but still. There it is. The round building in the center is the Keenan Building, by the way. There really isn't a heck of a lot of info online about this mall, and I still see no official homepage for it anywhere, so the best details to be found currently are actually right here on this blog. 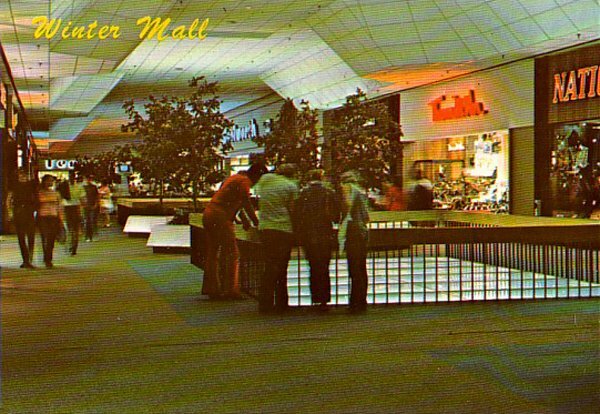 MOA readers responded with some nice comments and background history when I profiled this mall last time, so if you're interested, I'd suggest you check it out and read the comments there. Some fun memories and good info to be gleaned if you're hankering for it. 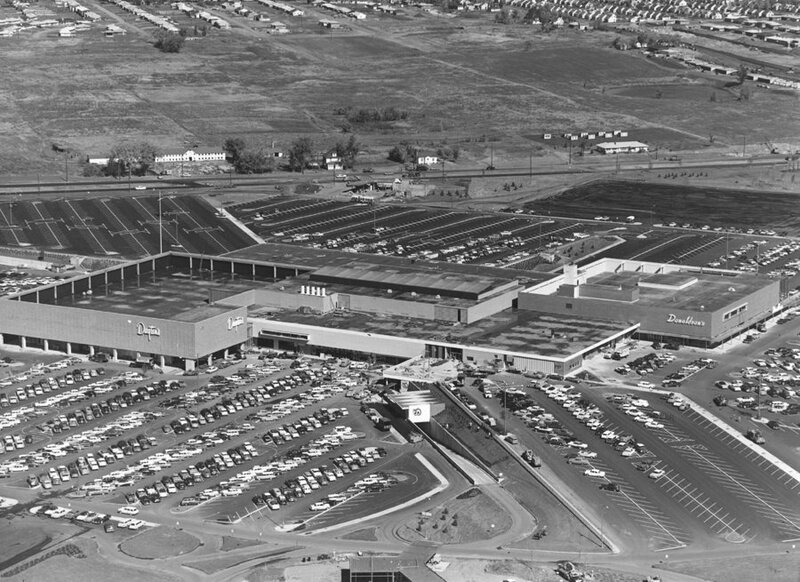 The Dayton's anchor wing as seen from the air in 1956, when Southdale mall had just opened. Everything was still brand spanking new here (and the world still fresh and clean) when this vintage photo was snapped! 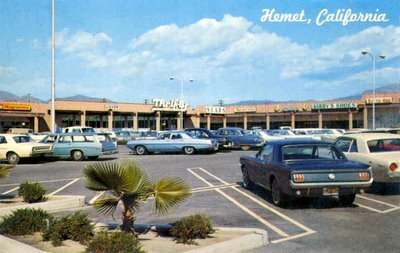 Vintage '60s postcard featuring an exterior view of Ramona Plaza, a little shopping center nestled in Hemet, California, in Riverside County. It appears Ramona Plaza is still there today but I have no idea what year it opened, nor is there any website of note for this small strip mall center. Some of the stores captured in this photo are: Thrifty Drug Store, Sears (so tiny! What kind of Sears store is this? ), Ries Department Store, Sally's, and Kirby's Shoes, among a few others. And lots of really cool old cars, too! I dig this shot. Vintage 1955 newspaper article heralding the grand opening of the old Valley Fair Shopping Center, in Appleton, Wisconsin (pretty much now defunct)... "The first weather protected shopping center in the nation designed with the shopper in mind." 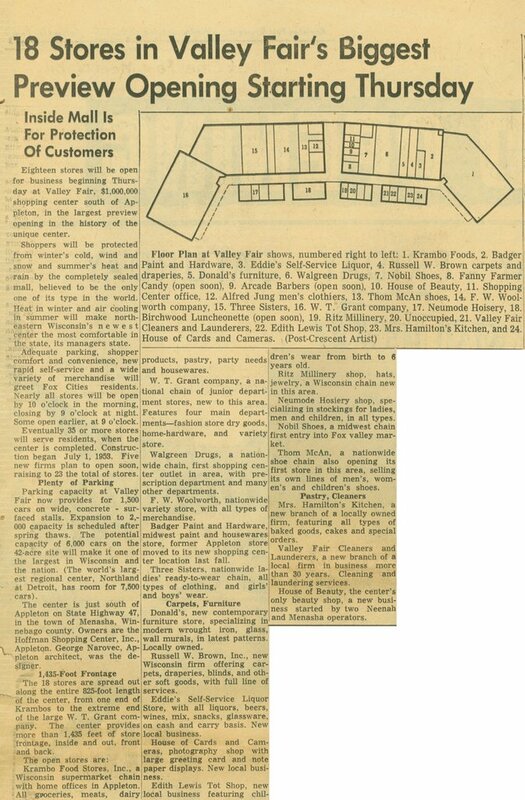 You can read the full article in its entirety in the scan image to the left, which also contains a floor plan diagram depicting the mall's original store lineup and layout. Very cool. 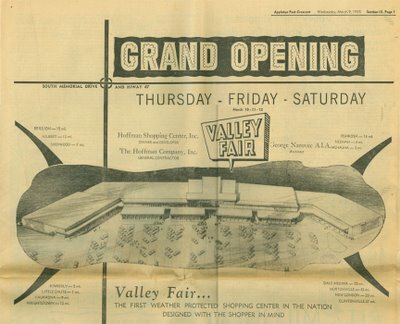 And besides that, it's also just plain chock full of all kinds of other groovy Valley Fair tidbits and early details! 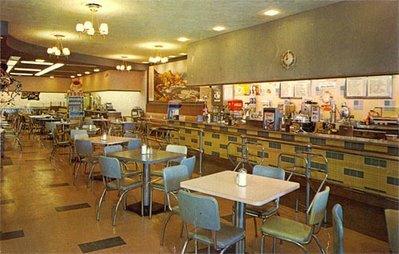 "It originally had six stores: Krambo Supermarket, House of Camera & Cards, Badger Paint & Hardware, Donald's, Hamilton Bakery and Eddie's Self-Service Liquor. 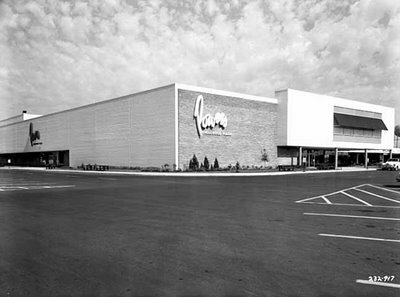 The mall was built by Hamilton Construction Company under the name Hoffman Shopping Centers, Inc. 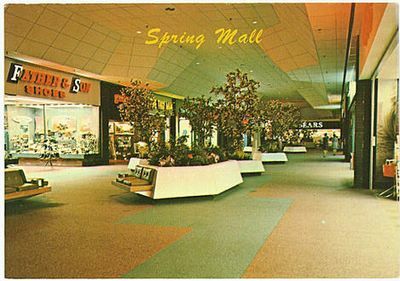 The mall was one of the first in Wisconsin to be enclosed, and is arguably the first enclosed mall in the world with its own climate controls. The next two years would see further expansion in phases, fronted on the eastmost end by a W.T. Grant discount store. 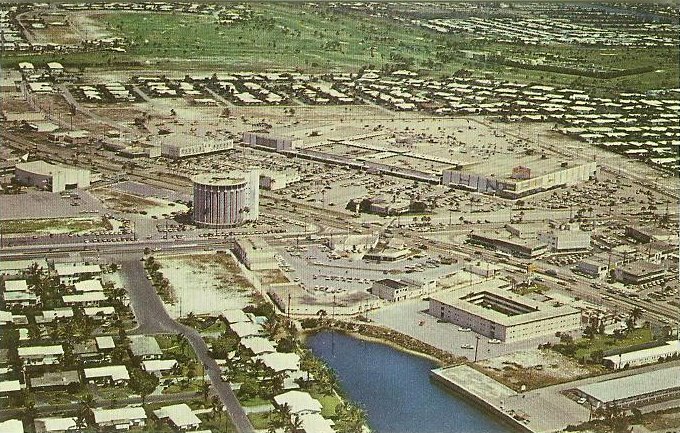 With this, the mall was fully completed by 1956. It would remain relatively unchanged at least up through 1976, when the Grant's anchor would cease with the rest of the entire chain. 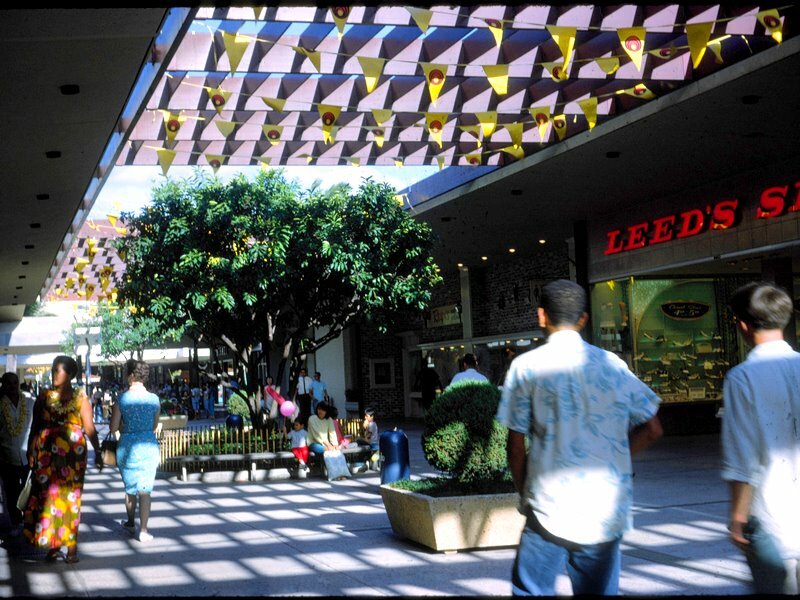 In 1978-1979, the mall would re-tenant and emphasize less on local businesses and bring in more nationally known tenants with a huge expansion and renovation project. Through the 1980s and early 1990s, the mall changed ownership several times. 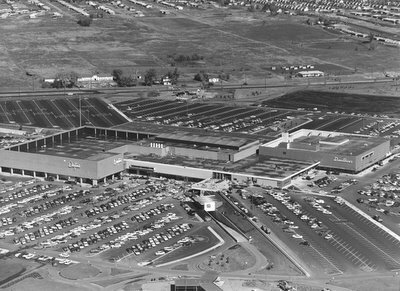 Foot traffic started to decrease when Northland Mall (Appleton) completed a major expansion, adding its own Kohl's Department Store anchor (built out of another former W.T. Grant store), joining a freestanding ShopKo with a new enclosed mall of 25-30 stores built between the two anchors in 1983." 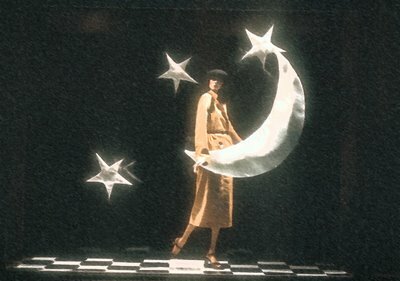 Mannequin, moon, and stars, in an unnamed department store window display somewhere, back in the 1970s. I just dug the shot. 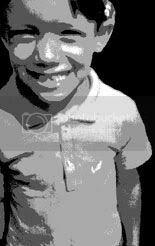 Photo is courtesy of extension 504's flickrset. (Excerpt) Hey, big spenders, Westchester shopping is now more upscale than ever. Gucci, the high-end retailer best known for its luxury leather goods and fabulous fashions, is one of the new arrivals at The Westchester mall in White Plains, joining Tiffany, Tumi, Tourneau, Louis Vuitton and Dooney & Burke. And let's not forget the anchors, Neiman Marcus and Nordstrom. With its marble floors, brass rails, sculptures and fountains, this 827,000-square-foot shopping nirvana offers consumers an experience on par with the world's ritziest streets. Think of it as Madison Avenue under one roof. The quite bustling looking exterior and parking lot of the swanktastic Cross County Shopping Center, the oldest and largest shopping mall in Westchester County, according to its Wikipedia page. (Excerpt) Twenty-seven years ago, sitting along a gravel township road in the middle of fields, West Acres Regional Shopping Center opened its doors for the first time. "On the land where Carl Rabanus raised oats, wheat, corn and barley for 34 years, the mirage has become a reality," The Forum wrote on the eve of the Fargo mall's grand opening. "The deep, black, fertile soil of glacial Lake Agassiz lies covered beneath parking lot asphalt, and like a dot on a domino, the West Acres building awaits its customers and a harvest of another sort." At the time, some considered Bill Schlossman's 15-acre innovation so ludicrous they labeled it Schlossman's Folly. Now an estimated 10 million people visit West Acres every year. 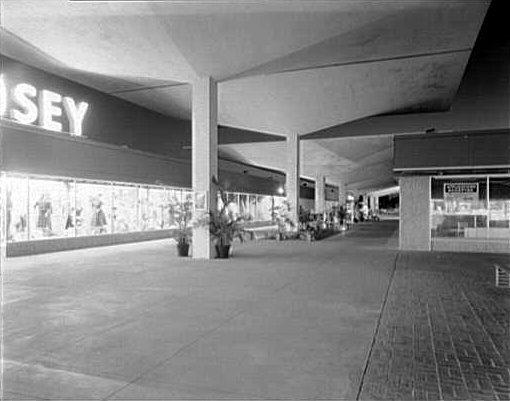 The modern concept of stores sharing the same roof first arrived in Fargo-Moorhead in 1950. 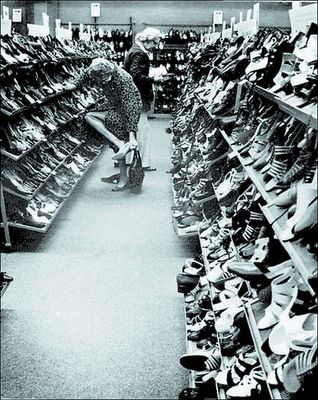 Woman trying on shoes at a Nordstrom store in 1976. 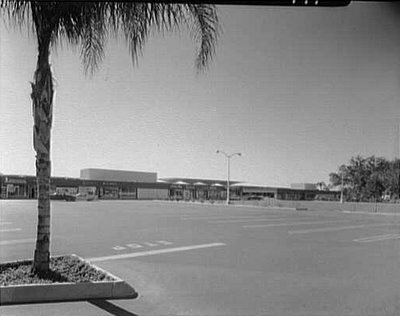 In and around the beautiful Cortez Plaza Shopping Center in 1959, courtesy of The Library of Congress. 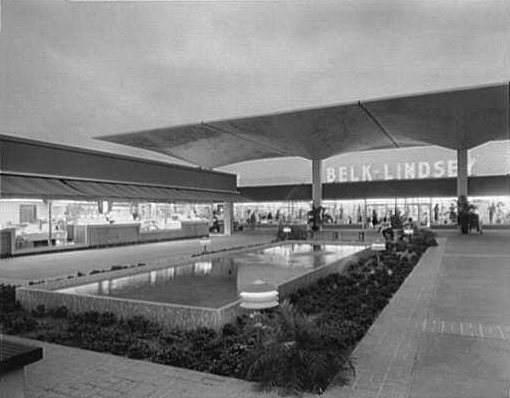 Nice shots of the shopping center early in its life, with a cool view, especially, of the Belk-Lindsey store (1st photo), sitting behind the court pool as evening falls on a late-fifties Bradenton, Florida. 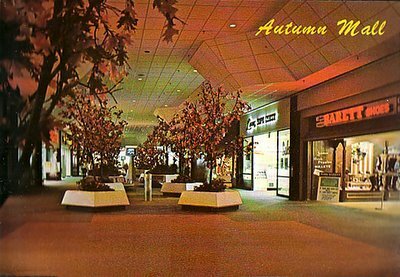 The Monroeville Shopping Center (not to be confused with the later Monroeville Mall), is featured in this vintage postcard I purchased last year. Stores visible are J.C. Penney, W.T. Grant, and Thom McCann Shoes, among others I can't quite make out. I don't know much about this shopping center, other than the fact that it appears to be an open-air strip mall, and was located in Monroeville, PA, dating back to the 1950s. I have no idea whether it's still around anymore, and if so, what the name of the center is now. Was this the basis site for Monroeville Mall years later in 1969? Not really sure. The back of this card simply says: "The beautiful Monroeville Shopping Center". Guess I'll just leave it at that, too. 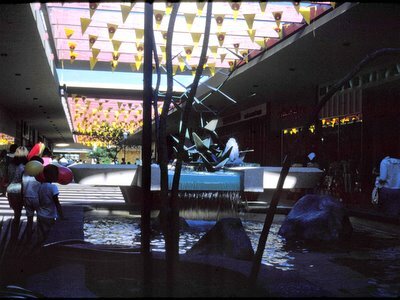 Edit: Updated post title to reflect that this is the Miracle Mile Shopping Center. 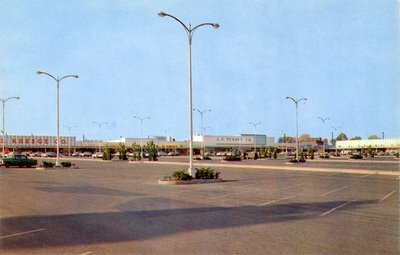 (Excerpt) City officials in St. Anthony Village, a first-ring suburb of Minneapolis, had a small-town, downtown dream for the redevelopment of the aging Apache Plaza mall, which sits almost empty in the heart of this community of 8,000. Minnesota's second-oldest enclosed shopping center (after Southdale in Edina) is scheduled to be razed and replaced by an urban village of housing, small shops, restaurants, walkways, ponds and an amphitheater along a meandering main street. But a funny thing happened on the way from the first plan for this new-urbanist scene to the current conceptual drawing for St. Anthony's $150 million redevelopment project: The outline of a large discount retailer -- perhaps a Wal-Mart or Target -- was added to St. Anthony's pedestrian-friendly new downtown after city officials recognized some changing economic and political realities. Video recording of a 1990 TV broadcast segment of the WEWS Channel 5 Eyewitness News, out of Cleveland. This clip covers the grand opening of the Tower City Center, a large mixed-use facility in downtown Cleveland, Ohio, which includes a shopping mall at its heart. While 1990 isn't all that vintage to me, I dig stuff like this and still found the video quite interesting to watch. Check Wikipedia's Tower City entry for more good background info. Yeah. Let's do this. 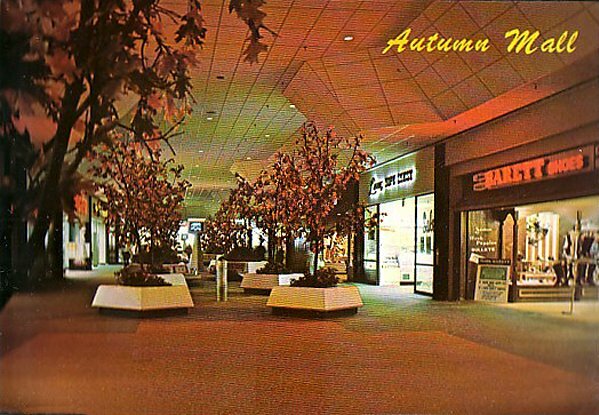 Here's all four "seasons" at the Park City Center mall, finally together in one supercool post. Oh no he dient! ...Oh yes I di-ed. As I've mentioned in the past, this mall (located in Lancaster, Pennsylvania) had a neat design theme going in its early years in the early 1970s, where all four main sections, or wings, had a distinctive look based on the four seasons, and they even called Park City Center the "Mall of Four Seasons". Each seasonal wing jutted from a central fountain court hub. Above and to the left you'll see a current map from their website, and even though the store lineups have obviously changed by now, the overall layout remains about the same. To the right is a vintage view (from another post) of the central court area, for your complete reference. Each season extended out into the mall proper from right here. You can get another nice view of the layout in their current aerial shot, which I link to at the bottom of this entry. 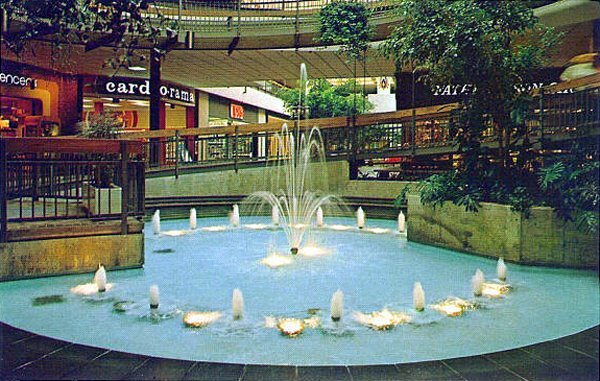 Let's get right to it with a really nice view of a court fountain in the then "new" Lehigh Valley Shopping Mall. And best of all... a groovy Spencer's Gifts store is just visible on the left! Many very cool childhood memories come to mind with that great kooky store. 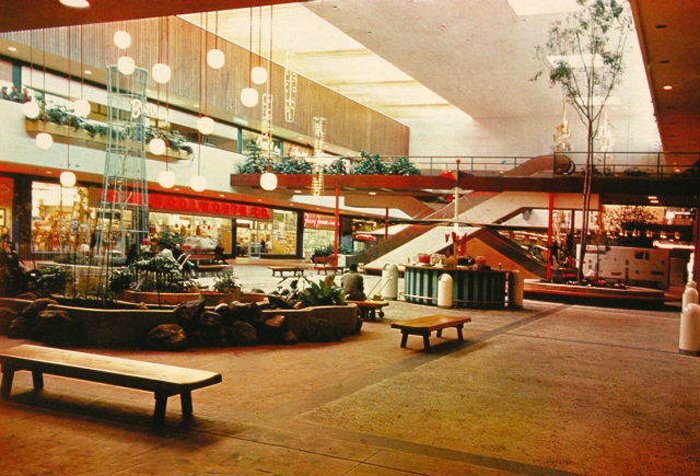 As I've mentioned here before, I practically lived at the one that was in Universal Mall in Warren, Michigan, back in the late-seventies and early to mid-eighties. Fun times man. 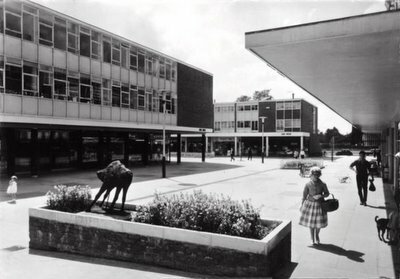 (Excerpt) Josephine Copeland and her 20-year-old daughter, Jo Jo, visited Primark at the Peacock Center mall here, in the London suburbs, to buy presents for friends, but ended up loaded with clothes for themselves: boots, a cardigan, a festive blouse, and a long silver coat with faux fur trim, which cost £12 but looks like a million bucks. “If it falls apart, you just toss it away!” said Jo Jo, proudly wearing her purchase. 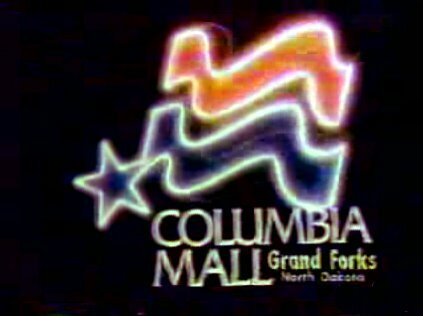 Here's an old Columbia Mall (Grand Forks, North Dakota) TV commercial spot from 1980. "Columbia Mall is an enclosed regional shopping mall in the city of Grand Forks, North Dakota and is located at the intersection of 32nd Avenue South and Columbia Road. It is the largest mall within 120 km. It opened in 1978 and was developed by the Dayton Hudson Corporation (now Target Corporation). The company anchored the mall with one of its Dayton's department stores as well as one of its Target discount stores. The Columbia Mall Target store was the first Target that was built as the anchor of an enclosed shopping center. 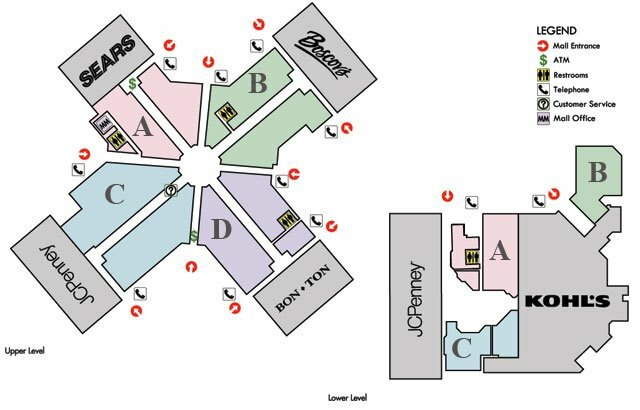 Today, Columbia Mall houses three department store anchors (Macy's, J.C. Penney, and Sears), a 460-seat food court, and over 70 smaller stores. GK Development, Inc. of Barrington, Illinois is the current owner of the mall and is in the process of updating it and expanding its offerings. The new Dakota Cafe food court and a children's play area both opened in the fall of 2005 and there has been discussion of a multi-screen cinema possibly opening in the future."